Pads contain 50 sets of 1 each white and yellow copies. Most farriers give the white copy to the customer and keep the yellow copy for their records. Also features handy wrap-around cover, with place to note the date of the invoice copies for future filing. Our invoice logos coordinate with the business card logos business card logos, and our shirts. Include your name, address & phone number. Other information is optional (email, cell phone, etc). We will use black ink. 3 Choose the header design layout. Header design may be customized to suit your needs - Extra space for comments, directions, credit card number and/or logos. 4 Choose a body layout. Open format allows you to write in the work you did. Itemized format has various services already present. These can also be changed/customized. 5 Choose a footer layout. You may want to choose a thank you phrase, space for next appointment, place for signature for receipt of goods and/or services. Send your information via email, phone, mail or fax. 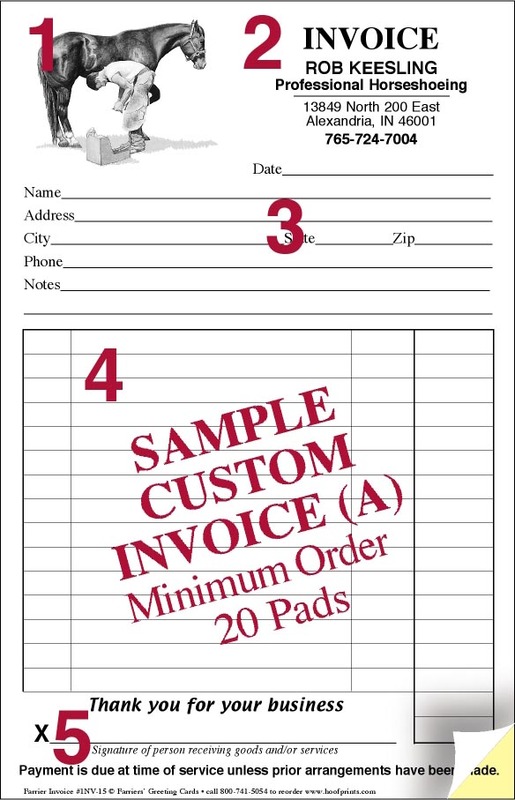 Remember, you must order at least 20 pads all alike to get custom imprinting. 7 We will make a proof. We will arrange the wording as requested and provide you with a proof. Normally the proof can be completed and on it's way to you within 48 hours. We can email, fax or mail your proof to you. Once you have checked your proof and approved it, your invoices will be sent to print. Please allow about 5 days to be printed, plus shipping time. Submit your order. We will email your proof to you.